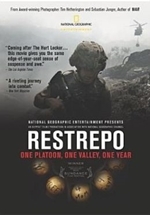 Restrepo is a 2010 American documentary film about the Afghanistan war, directed by American journalist Sebastian Junger and British/American photojournalist Tim Hetherington. The film explores the year that Junger and Hetherington spent in Afghanistan on assignment for Vanity Fair, embedded with the Second Platoon, B Company, 2nd Battalion, 503rd Infantry Regiment, 173rd Airborne Brigade Combat Team of the U.S. Army in the Korangal Valley. The 2nd Platoon is depicted defending the outpost (OP) named after a platoon medic who was killed earlier in the campaign, PFC Juan Sebastian Restrepo, a Colombian-born naturalized U.S. citizen. Restrepo received the Grand Jury Prize for best documentary at the 2010 Sundance Film Festival. It was named as one of the top documentary films of 2010 by the National Board of Review. It was nominated for the 2010 Academy Award for Best Documentary, losing to Inside Job.